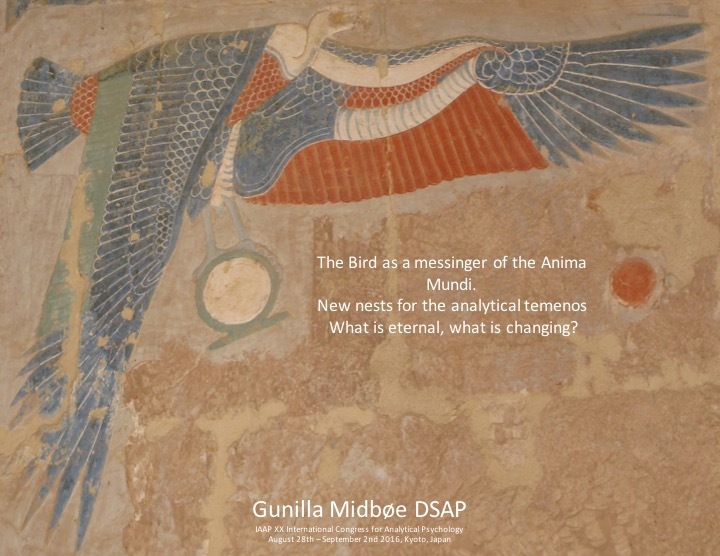 New nests for the analytical temenos – What is eternal, what is changing? This clinical presentation is following the bird, its nesting and eternal migration as a symbol of the anima mundi. Three dreams are presented with the following dialogue in the sessions and how the dream images of the bird emerged in the three different outer frames of the analysis. I met with my analysand face to face in my practice, we met in Skype sessions and via e-mail. The analytical frames are changing in our time of the internet world. The three different structures, nests, became clinical tools and not just second best to face to face analysis. They interacted with the transference, the symbol of the bird and they also became frames for balance of energy during the analytical process. The elliptical dialogue is an underlying working model for language and relationship I use for the intrapsychic and interpersonel connection. I will present the elliptical dialogue together with the clinical vignettes and show how it can be useful as a map for orientation and still keeping the temenos as an enclosure and protected sacred space when flying in and out from different containing nests. So can it be that we also can look upon our new technology as a phenomenon not separating us from the anima mundi but also facilitating for us as analysts and analysands to develop and catch sight of the psychic connection to the Anima Mundi? It is a challenge because of the easiness to both cross and break frames and borders. Birds have their nests they build and rebuild after mating and migration for the eggs and nestlings to come. Birds fly in and out from their nest and as messengers they also migrate to other worlds like the dove as a symbol of spirituality. The temenos as an enclosure, serves the purpose to protect an inner content or process that should not get mixed up with things outside. But are the outer and inner psychic reality for temenos changing regarding internet technology of today when we can fly with a birds eye view, crossing many zones of land, time and space and if so how can we keep the conditions stable for depth analytical work? As a background amplification to birds and nature as carrier of the Anima Mundi in literature I will mention the Japanese author Kenzaburo Oe (1935-) and the Swedish author Selma Lagerlöf (1858-1940.) They are both awarded with the Nobel Prize in Literature. Oes mother gave him The Wonderful Adventures of Nils Holgersson a novel by Lagerlöf about a naughty boy’s individuation journey on the back of a goose. Oe read the novel as a young boy and its impact Oe says ”he will carry to the grave.” In their writing they both condense life and myth in their native forest villages with life of present time.